Are you looking for advanced protection from dangerous respirable particles and hazardous chemicals? The AirMedic+ is our most efficient unit for particles and features the added protection of an 18 lb. 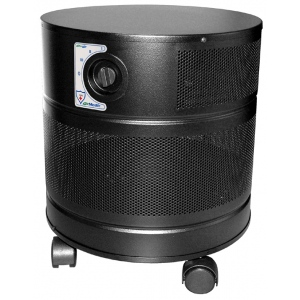 deep-bed activated carbon filter for chemicals, gases and odors. This remarkable filtration system uses a medical-grade HEPA filter to eliminate 99.97% of airborne particles 0.3 microns in size, in conjunction with our special Vocarb-blend carbon to adsorb chemicals, volatile organic compounds (VOC'S), gases and odors. Ideal for use next to desktop printers, in bedrooms or any area that requires particle and chemical filtration. * Operating Weight: 41 lbs.